In a typically witty moment in Skylight Music Theater’s Carmina Burana, a few sheets of paper flutter down from the great height of the Cabot Theater’s ceiling. Reading their messages, some of the characters react with joy; others with dismay. More and more papers fall; soon the stage is full of people scrambling and reacting in very individual ways. 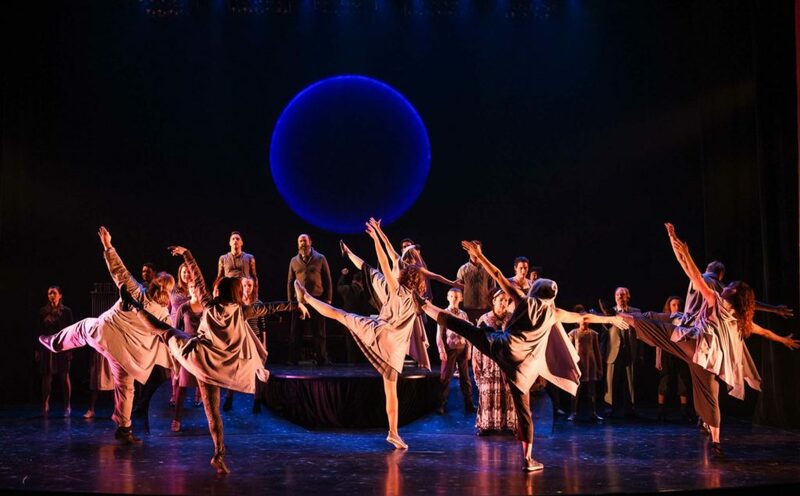 This mysterious moment is but one of the show’s many fragmentary stories; it showcases the lucidity of the singers’ and dancers’ acting skills and their seamless ensemble work. It also demonstrates Director Jill Anna Ponasik’s genius for pulling evocative action from both texts and performers. 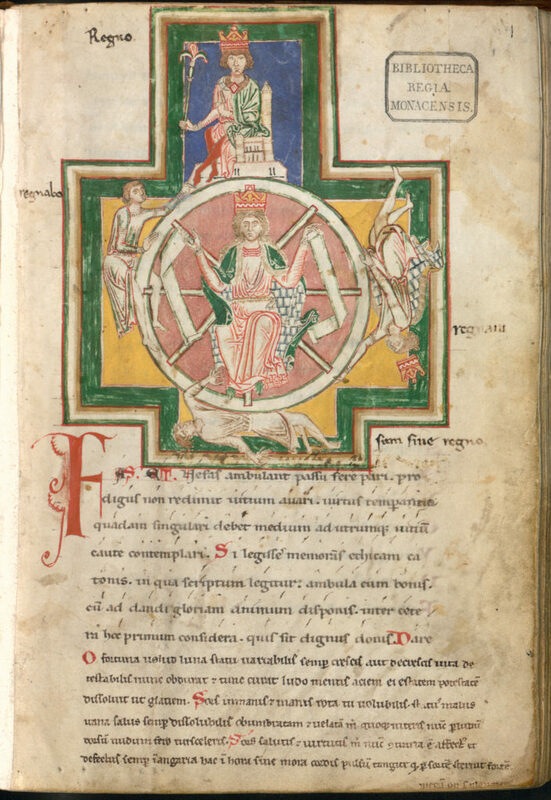 Carmina Burana is organized around the theme of Fortune’s wheel: the unavoidable uncertainty that is life’s only certainty; we are always winning or losing, rising up or on our way down, at the whim of Lady Luck. Every element of this fabulous production contributes to the sense of cyclical change, from Lisa Schlenker’s set with its curved ramps, dominated by a lunar disc which lighting designer Jason Fassl washes with subtly-changing moods and projections of “magical images” and lapidary text; to Shima Orans’ elegant costumes, conjuring a timeless modernity and encompassing a wide range of social classes; to music director Janna Ernst’s choice of arrangement, with an amazing six percussionists beating out the abruptly altering rhythms of Carl Orff’s score. Dani Kuepper’s choreography, while occasionally hyperactive, enlivens the space and successfully comments on the music’s many moods, while gracefully folding the non-dancers into the movement. Ponasik gives the transitions a pleasing, organic flow, bringing a painterly sense of composition, space, and contrast, along with a musician’s feel for rhythms and a dramatist’s sense of action. Together, the Skylight’s singers, plus four vocalists from the Chant Claire Chamber Choir, along with seven dancers from the Danceworks Performance Company and a number of impossibly adorable child performers—artists of a wide variety of ages and physical types—create a microcosm of the world with its many joys, griefs, conflicts, and relationships. From the first group vignette of a spring picnic interrupted by rain, the production paints a panorama of great humanity and the profound beauty of everyday life. Overall, the show is rich, deeply felt, and as much a joy to behold as it looks like it was to create. Just as Medieval scribes would wipe out old parchments and write over them, so Carmina Burana shows dizzying layers of meanings, each overwriting the last, but with traces of each still visible. The original lyrics were probably written by “Golliards” —wandering bards conventionally portrayed as unemployed college graduates who, forced to perform entertaining songs for a living, wrote laddish odes to drinking, gambling and love. The compilation of many authors’ work was given its title, “Songs of Beuern,” by a nineteenth-century scholar, based on name of the Bavarian monastery where he found the manuscript. A century later, modern composer Carl Orff fell in love with the songs’ poignant, often ironic tone, and condensed them into his musical setting, intending it to be a sort of gesamkunstwerk—a total theatrical spectacle combining music, text, dance, art, and metaphysical profundity a la Wagner. Now we have the production presently playing in the Cabot Theater, radically erased and overwritten again to suit twenty-first-century sensibilities. There is certainly nothing laddish about this production. One thing we conspicuously don’t see is any representation of the boy/girl romance that was a mainstay of the earlier texts. 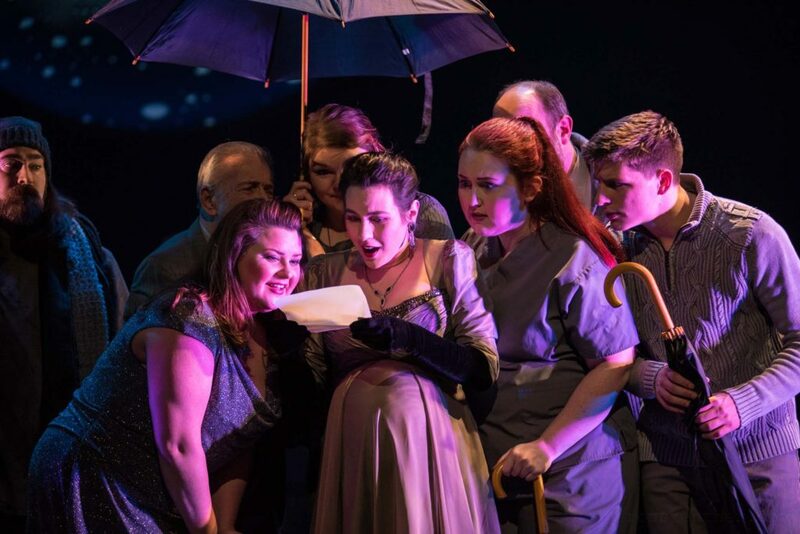 As if on a mission to cleanse classical music of its patriarchal taint, Ponasik has steeped her show in feminist values, creating scenes which, while charming, dramatic, and personal, are unlikely to have occurred to any Golliard. She expands the meaning of “love” to include a wide spectrum of gynocentric concerns: the lament of a lover waiting for his mistress becomes a mother’s patient longing for her unborn child; we see an entire baby shower materialize, as guests literally shower the expectant mom with presents. Cute little girls smile before a mirror asking “am I pretty?” followed by a matronly woman asking the same question. A seduction song becomes a brutal pas-de-deux in which a woman strenuously resists submitting to a would-be lover’s insistent demands. Another enigmatic duet shows two women in a tense and unrequited encounter, which seems to end with one’s death. And it’s hard to know exactly what to make of a tavern scene in which a glitter-clad person of indeterminate gender tries to hand out potatoes, which are spurned by the crowd in favor of fast food fries. As the supertitle reads: “Left is right, up is down. Therefore I drink.” It might be hard to find a phrase that more succinctly captures the mood of our times. As new meanings overwrite old ones, things are gained and things are lost; the wheel of fortune keeps turning.